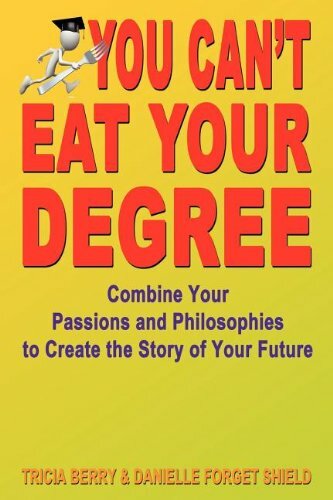 More information can be found at http://www.825basics.com/shop-825-basics/you-cant-eat-your-degree. My co-author, Tricia Berry, and I both have backgrounds in engineering. We use the process knowledge and problem solving strategy learned in engineering and apply it to career strategy. We’ve been successfully sharing these strategies for over 10 years. We were inspired to write this book because college students have such an opportunity to use their college experiences to get a jump on career strategy and communications. A few simple strategies can be the difference in having a job you love or no job at all. We like clever titles that paint a picture. You Can’t Eat Your Degree hits both points. No real obstacles in publishing. Our obstacles come in limiting ourselves to the amount of information we share. We’ve found that longer how-to books can be scary and imply a difficult process rather than an easy process. We didn’t set out to be writers. We set out to educate college students in much greater numbers than we can reach through traditional speaking methods. Not really – just get started and dedicate time to it daily. Learned more about methods of publishing and distribution channels. Create a market for the book before publishing it. I like to read business books and clever, humorous mystery books. Grisham and Evanovich are my pleasure reads. Yes, our Rise Above the Noise series is set to debut later this year. These will be the ‘airplane’ style books with a lot of content focused on one specific topic, but short enough to read on a flight. You have to feel good about what you are doing. Career focused, college student or early career professional, interested in professional development to move their job search and future career in the direction that suits them personally.